A legend in the electric bicycle industry, the Phantom X is the most aggressive and affordable pre-built electric bike in the market today. The superior strength and high torque of the 500 watt direct drive motor mounted in the rear wheel ensures that no obstacle, no matter how steep, will stand between you and a leisurely cruise through town. Nimble and bold, you will love riding the brushed aluminum Genesis 500. 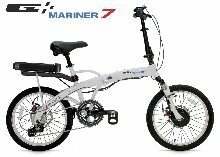 Reaching speeds of up to 20 mph via the powerful 500-watt motor mounted in the rear wheel, which delivers 720 watts at peak, this is the synthesis of high-energy efficiency and top-level performance. Simply use the half-twist throttle to activate the "power-on-demand" propulsion system. The energy efficient 38-volt, 9-amp, high-capacity advanced lithium ion battery (LiFePO4) enables you to ride distances of 25 to 30 miles per charge. Thanks to the SRAM X5/X7 Twist 8-speed shifter and Avid BB5 disc brakes riders are certain to enjoy a smooth and effortless ride even while offering the option of pedaling for exercise. Continental Double Fighter 26-inch tires add to the winning look and performance for light off-roading and city riding. Storage is easy thanks to the aircraft-grade aluminum alloy folding frame. 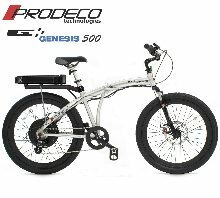 The Genesis 500 is easily adjustable for virtually any-sized rider and makes for great, green energy transportation. 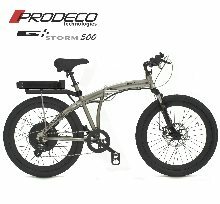 This is an amazing ebike, Prodeco has the best group of models of ebikes I have ever came across. We are real excited about being the only authorized eBay dealer for Prodeco Technologies. 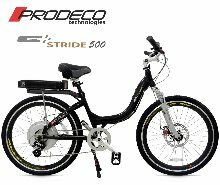 This is an amazing ebike, Prodeco has the best group of models of ebikes I have ever came across. We are real excited about being the only authorized eBay dealer for Prodeco Technologies. The quality of the bike itself is worth $800 and the motor and battery are like almost a free bonus. It rides just like a regular bike with no resistance and when you want power, just press the throttle and the 36V 500W motor comes to life and will help with the hills.